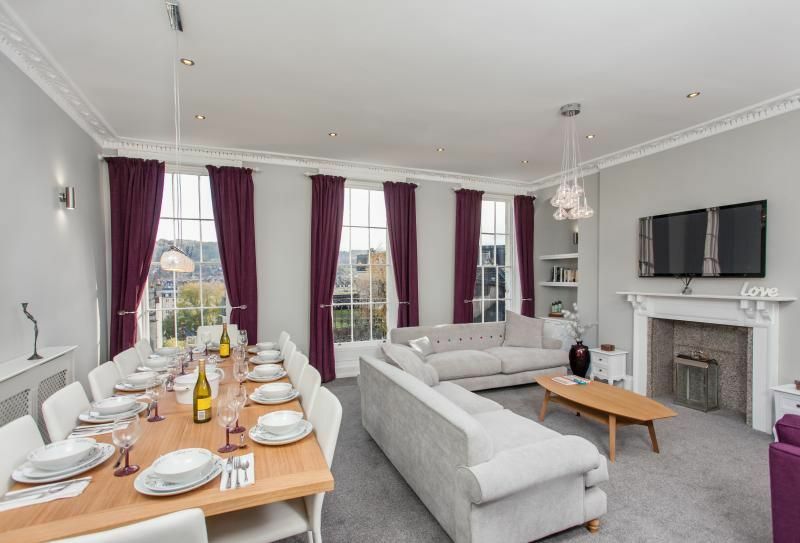 Live the high life at this spacious and contemporary apartment for 13 in central Bath. Perched above the Mantra Restaurant with fabulous city views and a thriving night-club scene just a stone's throw away, you'll see why Georgian Bath became the hottest ticket outside London for its top combination of shopping, fashion, entertainment, high society, eye-catching architecture, and health benefits from the thermal spa waters. 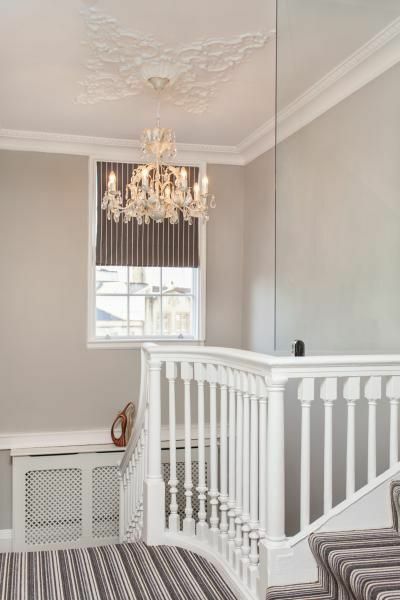 The grand apartment in a listed Georgian building has been given a contemporary makeover in pavilion grey, with an impressive staircase leading up to the large open plan living and dining room, sociable kitchen and 6 bedrooms, all with their own small TV and DVD. 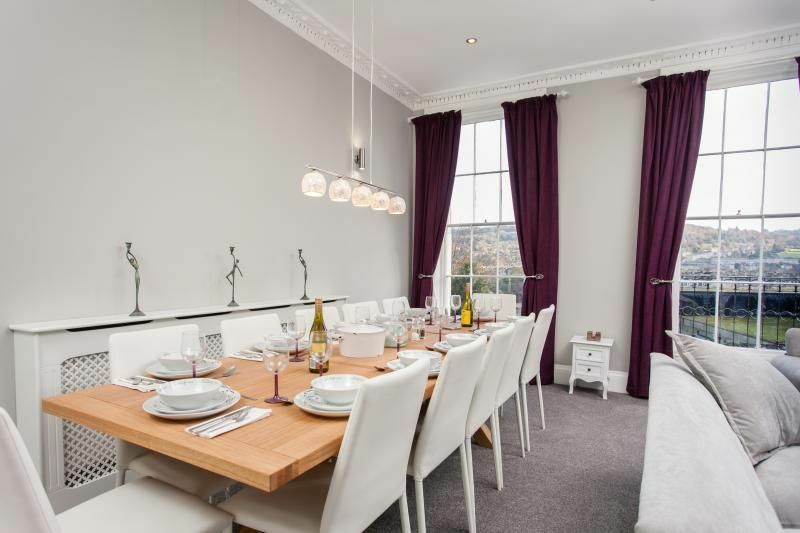 The living room is great for gatherings, with high ceilings and three tall sash windows with glorious views of distant hills, Grand Bath stone terraces, Sham Castle and Bathwick Hill on the eastern slopes of the city. Below are gardens and buzzing outdoor terraces when the restaurant is open. There are stylish sofas to seat 12, one of which is a sofa-bed and additional pouf chairs for extra seating. 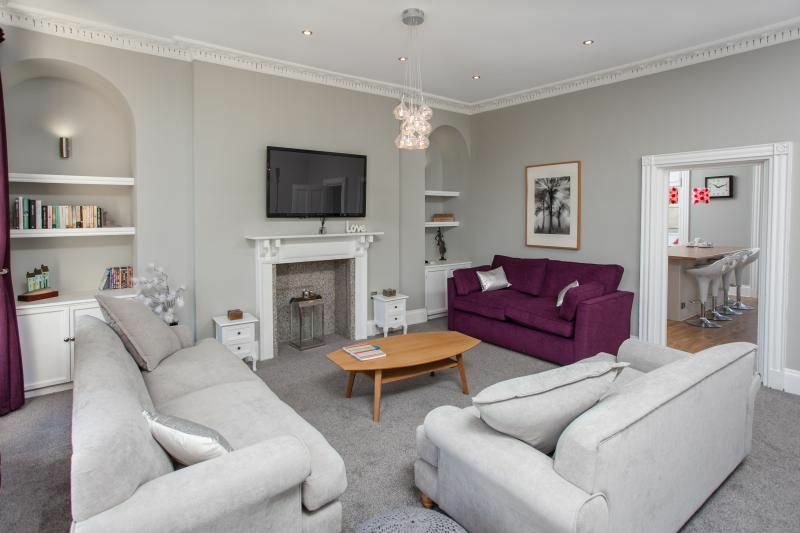 Above a marble lined decorative fire-place is a large TV with DVD and deep alcoves on either side hold a selection of books, games, films and Wi-Fi. At the other end, a large oak table seats 14 with comfy leather dining chairs for all. The sociable fitted kitchen has oak floors and a wood-look surfaces, with a large central island and breakfast bar with stools for 5. There is an electric hob with oven, a large fridge with separate freezer, a dishwasher and lots of storage. Turn up the sounds on a retro radio with ipod docking and mix cocktails by a large white dresser with an extensive collection of glassware and crockery. 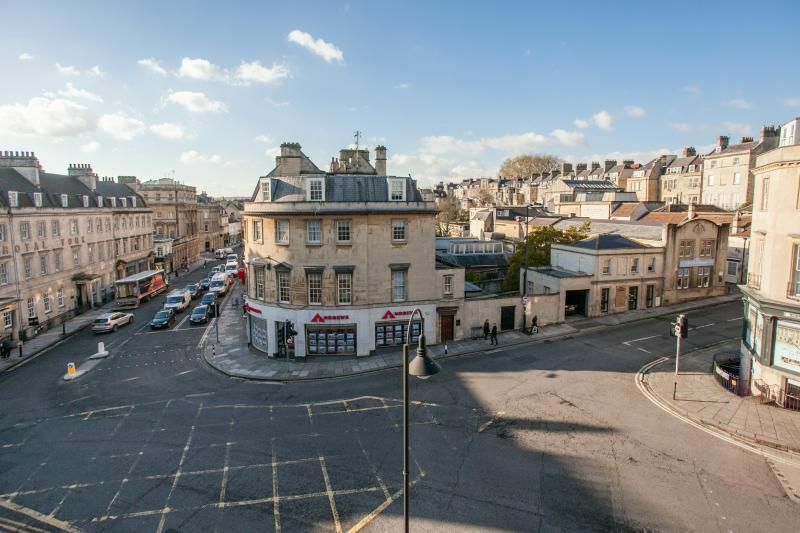 There are lively views of the city streets with handsome Bath stone buildings, vintage shop fronts and café society. The striking staircase continues up to the second floor with 3 bedrooms and a shower room at this level, all with views. The first charming bedroom in grey and sage has two 3' twin beds that zip and link to become a 6' bed along with an easy chair that doubles as a fold-up bed. This room has a fitted wardrobe in one alcove, beside a pretty decorative fireplace and small hand basin in the other, with a couple of small chests for storage and a small TV with DVD. 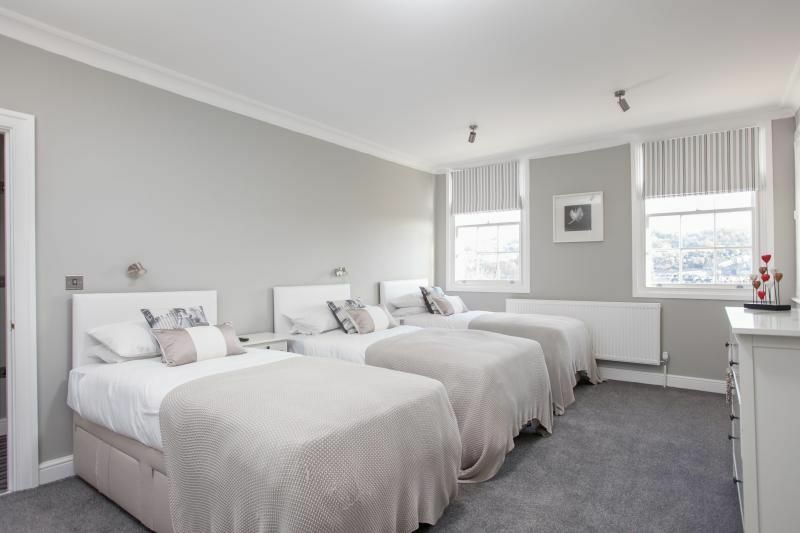 The next spacious room in grey and taupe is a triple with three 3' beds, two of which can zip and link to be a 6' double. It has a fitted wardrobe with shelf space, along with a chest of drawers with TV over and shoe storage with mirror over. 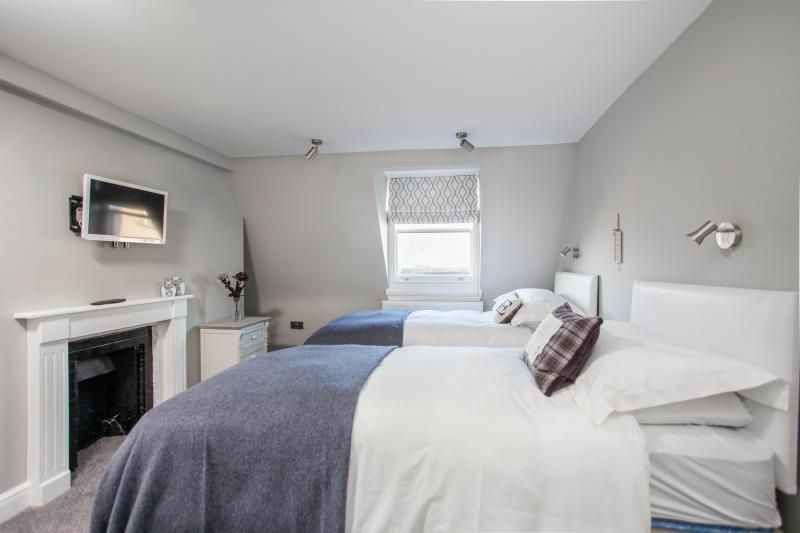 The third double bedroom in grey, silver and turquoise is sweet, with a 4'6'' bed, a silver chest of drawers with TV over and a little alcove to hang clothes. 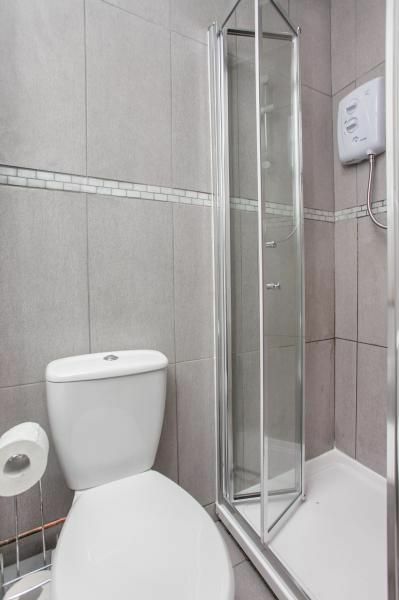 This floor has a small contemporary tiled shower room with walk-in shower, small hand basin with some storage under and WC. Housed in an under-stairs cupboard next to the shower room, is a washing machine combined with drier. The top floor under the eaves has 3 bedrooms with views over the rooftops to the surrounding hills. On this level is a family bathroom and a small shower room. 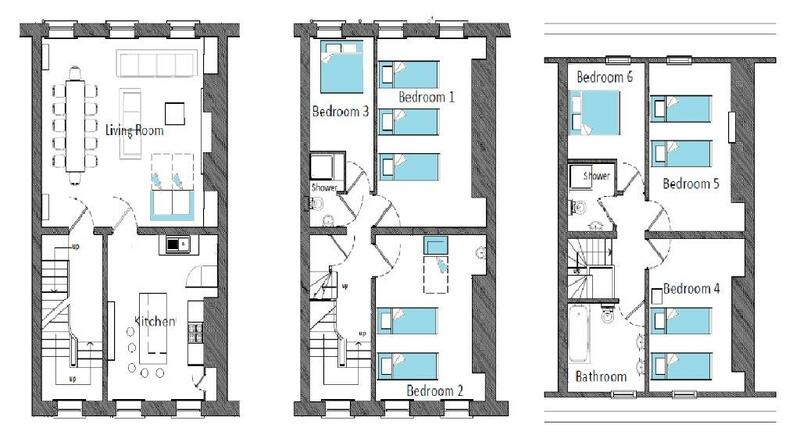 The first bedroom is a smart twin room in grey and charcoal with two 3' beds that zip and link to become a 6' double. There is a fitted wardrobe with several chests of drawers and a small TV over a decorative fireplace. The next spacious twin is in grey and green with 3' beds that zip and link to become a 6' double. In this room is a fitted wardrobe with several chests of drawers and a small TV over a decorative fireplace. 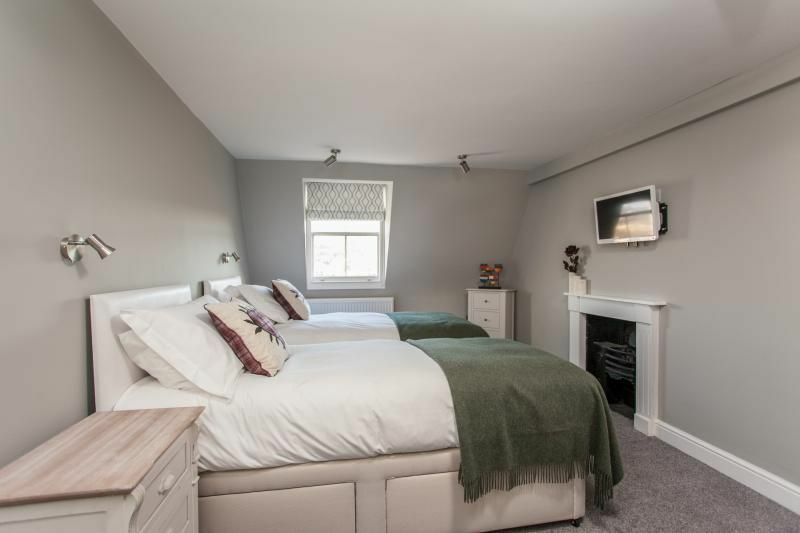 The final cosy and compact double room is decorated in grey and heather with a 4'6'' bed with chest of drawers and small TV. The spacious family bathroom has double stone hand basins set onto a small grey dresser, a bath with shower handset and WC. 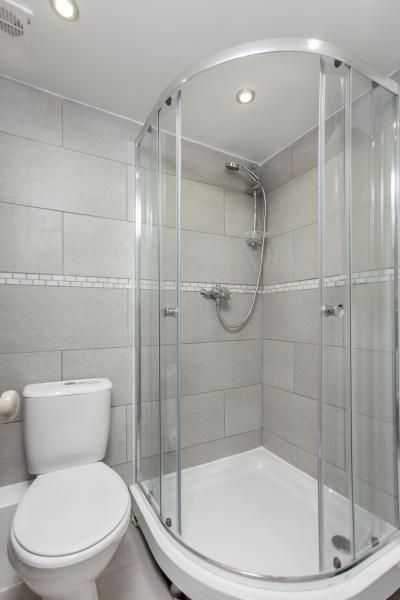 Additionally, there is another small contemporary shower room with corner shower, hand basin and WC. It is difficult to be more central and everything truly is on your doorstep. George st is adjacent and is lined with night clubs, restaurants, galleries, shops and wine bars. Close by is Milsom Street, Bath's main shopping thoroughfare, which leads down towards the Pump rooms, the Roman Baths, thermae spa and Bath Abbey and in the opposite direction is the famous Circus and Royal Crescent, set in front of lovely Royal Victoria Park where you can enjoy miniature golf, botanical gardens, hot air balloon trips and a children's outdoor play area. Whatever you choose to do, shopping, sightseeing or entertainment, most pursuits are a pleasant stroll of about 5-10 minutes away from your apartment. Adjacent to the property is Mantra Indian fine cuisine restaurant. A parking permit is provided allowing you to park 1 car in resident bays on neighbouring streets. Charlotte Street car park is also a 5 minutes' walk away or the park and ride bus stops around the corner from the property. The Bath Spa Railway and bus station are a 10-15 minute walk. Alternatively Lansdown park and ride would be your cheapest parking option and the bus runs very regularly and takes you to the bottom of lansdown road where the property is. I just wanted to say a huge thank you for all of your help in letting us stay at the Haystack this weekend. The house was absolutely perfect for our occasion and Sara could not have been more helpful on Friday. Beautiful Home... Centrally located with easy access to the beauties and wonders of Bath ❤️❤️❤️ We loved our stay at in Bath and we are definitely coming back . We were a group of 11 ladies and the house was spacious enough for us and did not give us a feeling of being cramped in. Kitchen was well equipped but things like a blender would be a much welcomed addition to the house. Also a nice coffee machine would be appreciated for such a grand home. Also a small hoover would be nice if we wanted to do a quick clean. Bedroom were very comfortable , mattress were perfect but the pillows were really not nice and too soft . Spare bathroom floor mats would have been welcomed. Internet was very bad and did not work during our 6 days stay. Sara and Alexia were very professional and prompt with email replies. We had a problem with the dish washer and it was rectified quickly. All in all we loved our 6 days here and will definitely be coming back . Such a great location. Really thoroughly enjoyed our stay. This was a prime location and accommodation for a large party, such as a hen do. Would really recommend. The house was beautiful. 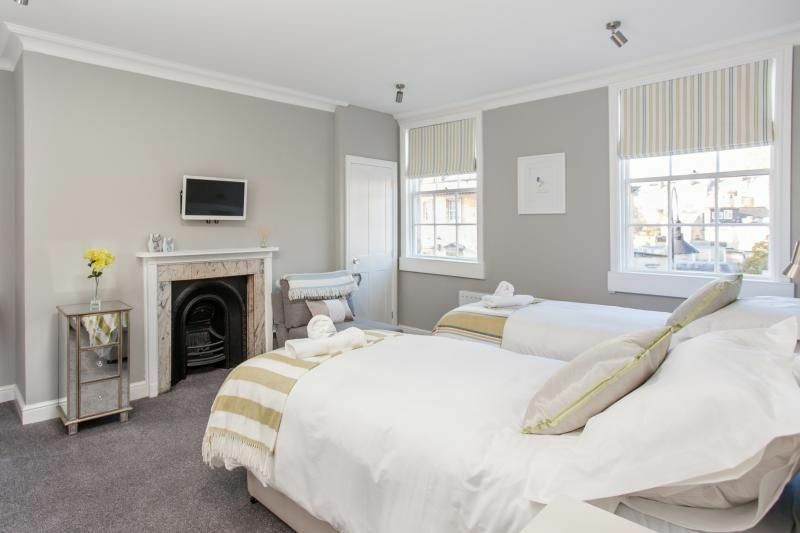 Top pad for a city break in beautiful Bath We were a group of 14 (age range 22yrs - 50ish!!) and we could not fault the location, the layout of the apartment, the facilities (although one shower room was a bit smelly) and the attention to detail. Could not really be much closer to all the shops/restaurants and bars. It was quiet enough for a city apartment, felt very safe and secure. Clean and beautifully presented. We are not a fussy bunch of birds but equally like things to be of a good standard. We got what we paid for and were very satisfied. Great value for money! We booked this property for my sisters hen Do and it was amazing!!! 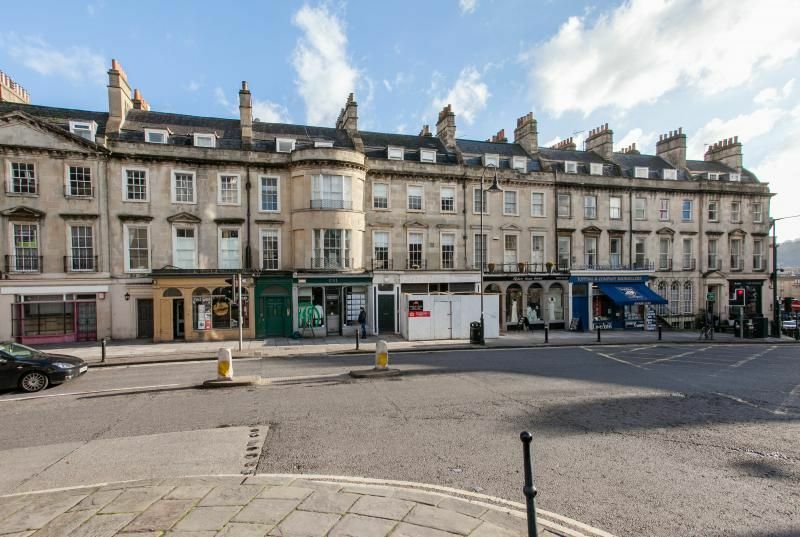 The location was excellent being super central and close to all the beautiful shops, sights, spas and restaurants Bath has to offer. Parking is a small problem but to be expected being so centrally located, just plan in advance where to park - we used a site where you could rent private parking spaces instead of council car parks which was a lot cheaper! Otherwise great house, fab location, expensive but we felt worth it. Would highly recommend The Haystack! Such a great house, very well stocked with excellent communal space and located so centrally. Would highly recommend for a hen do/girlie weekend! We had a great hen weekend at the Haystack. The location is excellent, right in the centre of Bath. The house is beautiful, spacious, well equipped & clean. The layout of the house makes it really sociable. The owners were very informative and helpful. I would definitely recommend the Haystack. Gorgeous apartment with great decor. Everything you could need provided. Lovely and warm even over a very wet and chilly weekend in November. Extremely central location with everything only a short stroll away. Would thoroughly recommend! 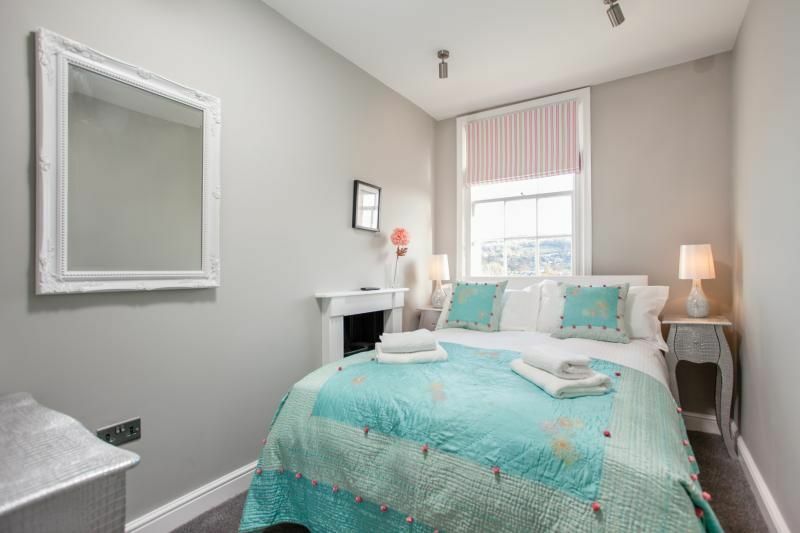 "Another fabulous stay at the Haystacks, bang in the centre of Bath. I'd forgotten how luxurious the bedrooms and the bedlinen were! And everyone at the agency super-helpful and charming. See you next year." Haystacks is the perfect house for a large group. Every room is finished to a high quality, so everyone in the group was happy with their space. The location couldn't be better: only a short walk from the station and literally a stone's throw from the street with the best clubs and bars. It was ideal. I would recommend it to anyone. Stayed here for the weekend for my sisters Hen party and absolutely loved it!! The house was stunning and perfect for what we needed. Pretty pricey but worth every penny! The kitchen and lounge were huge and perfect for large groups. Definitely recommend!! We had an absolutely fabulous stay at the Haystack. The location was perfect with everything within walking distance, especially our favourite bar Sub 13! There was plenty of space for everyone to relax and the bedrooms were all lovely with modern decor. 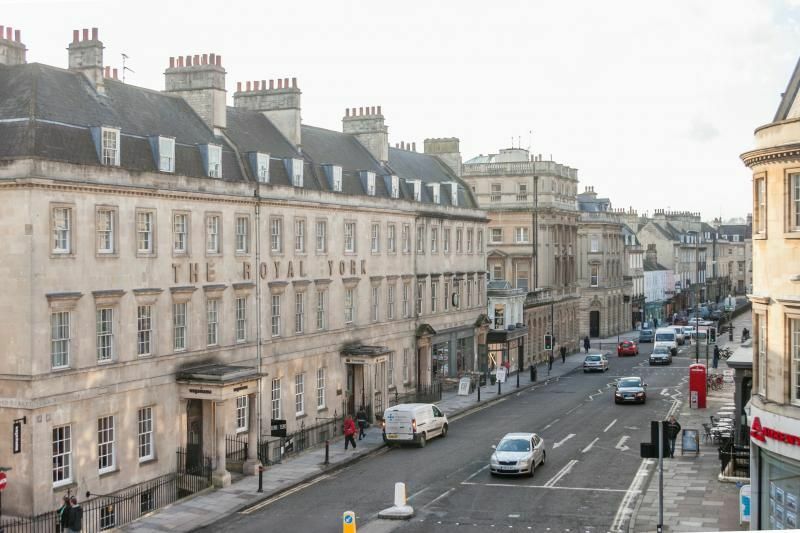 We would definitely recommend staying here for anyone that wants a bit of luxury in the centre of Bath. Thank you! We stayed at the house for my 30th Birthday. It was gorgeous and had everything that we could possibly need. It was in a great location and we could easily walk to everything in the town. I would highly recommend staying here. Fabulous apartment in the most amazingly central location. Bedrooms were lovely, really good quality bedlinen and stunning views over Bath. Friendly, helpful team managed to arrange everything for us at a day's notice. Twelve of us recently stayed at the Haystack in Bath and we would highly recommend it. The flat is large, airy, very clean and fully equipped with everything we could have wanted for our stay. We were greeted by Olivia from Bath Rentals who was very helpful and had left wine and chocolates which was a lovely touch. The haystack is in a great location and although we only stayed for a weekend the fact that we were so central allowed us to fit loads in to the time. We had a great hen weekend in Bath and loved our stay at Haystack! The flat was lovely and very central for bars and activities in the city. Your staff were very helpful – we had an initial concern because the previous guests had turned off the refrigerator, but it came back on quickly and the staff from Bath Holiday Rentals were great, both about reassuring us that it would be fixed if necessary and following up with us a few hours after we arrived to make sure it was cooling off. The flat had plenty of room for our group of 10. I’d highly recommend Haystack to other groups. My partner and I stayed here for a mini break away and absolutely loved it. 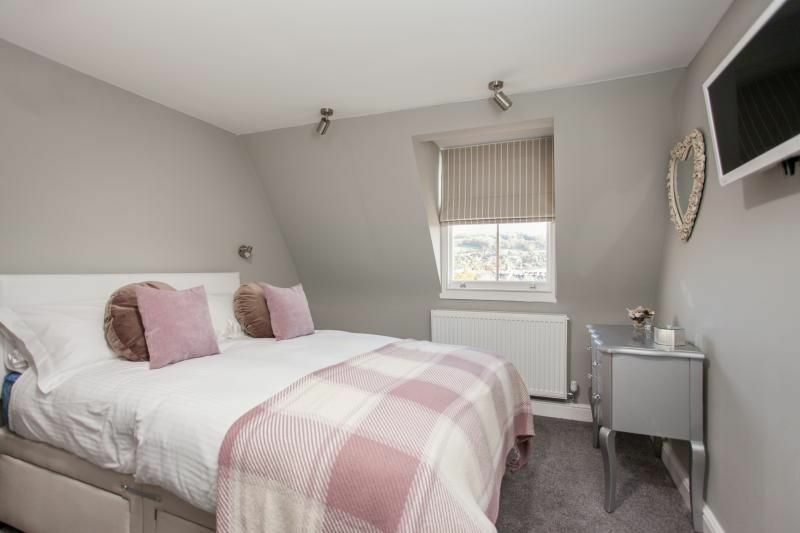 The house is pristine, beautifully decorated, warm and couldn't be in a better location, just a stone's throw away from all the wonderful restaurants and attractions Bath has to offer. 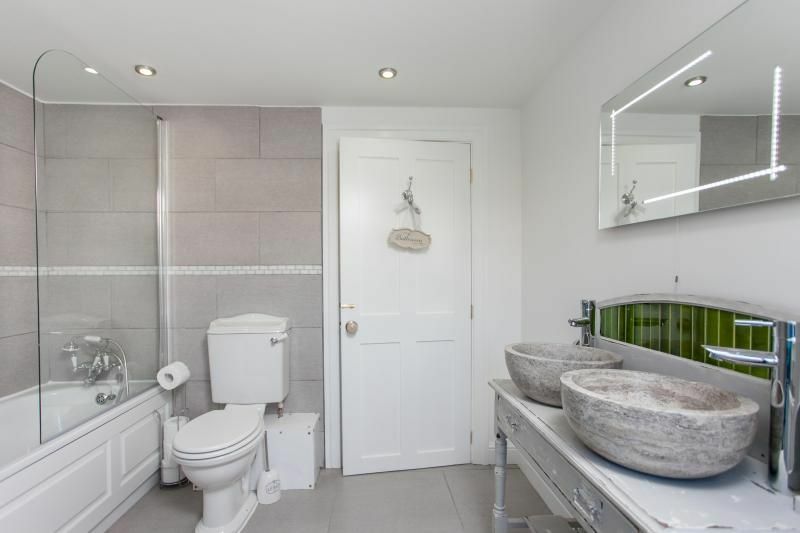 We both would thoroughly recommend this beautiful home to anyone who fancies a lovely, quiet getaway but who would also like to enjoy the hustle and bustle of Bath! We booked Haystack for a hen weekend and it was so lovely the bride-to-be cried when she arrived!! Having never been to Bath this was the perfect base to explore the city from, with lots of bars and restaurants close by. The house is fully stocked with all the kitchen wear you could ever need, and a dishwasher so no-one is stuck with washing up duties! Booking was quick and simple and we were personally greeted by the lovely Olivia who helped carry our many bags and made sure we were all settled in. Thank you for a wonderful weekend!" Amazing apartment. Beautifully decorated, great facilities and brilliant location. Customer service was outstanding. A perfect weekend. Thank you. The flat was absolutely perfect, everyone was very impressed with the standard of the accommodation, spotlessly clean and of a very high spec. Everything we needed was provided, even the location. We had a fab time, the house is beautifully presented and very well equipped, it had everything we needed. The other massive bonus was how central the house is, we were could walk everywhere, explore and enjoy lovely Bath. We would book again in a heartbeat- great house!!! If you are looking for glamour, comfort and privacy then look no further than The Haystack. I stayed here for a friends Hen Night and it was perfect! The location - excellent and views over Bath stunning. Leaving us Maltesers & wine! The decor - it's given me some ideas for my house and the kitchen has more appliances and glassware than John Lewis! Very Tasteful !! Would I stay here again? Without a doubt - infact, I wish it was my very own home! I could move on tomorrow! Couldn't get the dishwasher to work. Bathrooms smelt a little damp on arrival. I phone dock 5 (not 4) and I have I phone 4. And the worst part about it was that, We had to leave! A social party house that is perfect for anybody who wants to entertain and soak up the City! If you are looking for glamour, comfort and privacy then look no further than The Haystack. I stayed here for a friends Hen Night and it was perfect! The location - excellent and views over Bath stunning. The Service from phone manner to check in was welcoming, organised and friendly – even leaving us Maltesers & wine! The decor - it's given me some ideas for my house and the kitchen has more appliances and glassware than John Lewis! Very Tasteful !! Would I stay here again? Without a doubt – in fact, I wish it was my very own home! I could move in tomorrow! We very much enjoyed our stay at Haystacks and would gladly stay there again. The accommodation was top notch and in such a great position at the centre of Bath. There were 12 of us in total and the property made it so we never felt cramped and everyone enjoyed it. My friends arranged and booked Haystack's for my Hen Weekend and I had a wonderful time. The house was perfect for our needs, with lots of single beds so no one had to share, the kitchen was better equipped than my own and I loved the style of the house, I have even pained my own bedroom Pavilion Grey! The location was perfect for what we wanted. Some noise is to be expected as it is right in the City Centre but you wouldn't go to a city centre town house and expect it to be peaceful. The rooms at the rear of the house incidentally could hear no noise at all. We were only supplied with one toilet roll in each bathroom and with 12 girls they soon went, but we were self catering and although it would of been nice to have more, I wouldn't expect to have been left a supply so it was no problem to nip and get our own. I felt the house was as described on the website and exceed our expectations. It's a shame that 1 member of our group felt it wasn't value for money but that didn't represent the opinion of everyone else and we really did have a brilliant time. We had a great hen weekend and the bride to be loved it - the house was simply perfect! We all really enjoyed our weekend there and found it a fantastic venue as a base for our celebrations and explorations of Bath. What a great stay it was! Olivia has been upmost helpful in the whole process. The girls thought the house was fabulous, it's a fantastic location and was extremely comfortable. I loved the toiletries left for every individual, I thought it was a great touch. The house was fully equip with everything we needed. Beautifully decorated and furnished. I would most definitely recommend it to any large group visiting the beautiful city of bath. This property was everything and more than needed for our special Hen weekend. Not only is the property decorated to a high standard it is also a very clean and tidy, warm, comfortable and located perfectly. We got greater by the lovely Olivia who showed us the property and gave us a pack about the property and detail of favourite places to go in Bath. In the kitchen was left 2 bottles of wine amd a large boc pf chocolate s which was a lovely touch. kitchen is fully equipped, I even managed to cook a 3 course meal for the 10 of us with no issues (the dishwasher really helped there). In each bedroom there was very comfortable beds with high quality duvet and pillows made for a great night sleep (even with restaurant and late night bars nearby). The 3 bathrooms were clean and had shampoo, shower gel and soap for every guest). The only issues I think we had was one of the showers was a little small and there was not outside space (apart from on the main street) but once settle this did not bother us at all. All in all the most fantastic weekend any Hen could wish for. 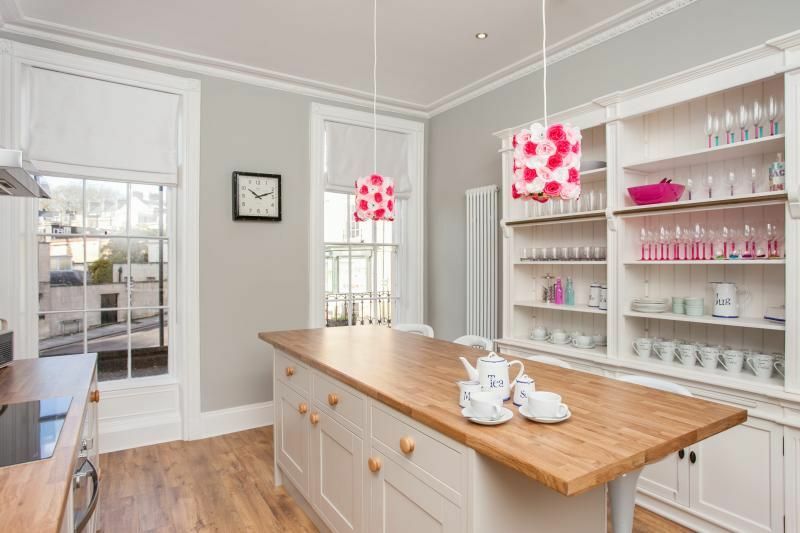 I will definitely be using bath holiday rentals on my next visit to bath. We had a fantastic stay at the Haystack. The place was really nicely decked out with a huge amount of living space relative to beds. We were 12 people and didn't feel in any way crowded. We did some serious cooking which the house stood up to with only a couple of minor issues which Alexa at Bath holiday rentals immediately committed to sorting out. The position was perfect for us, a bunch of 30 odds catching up for some nice food and a bit of mellow partying. Very central with a club downstairs and everything within walking distance. Because of Haystack's thick walls you can enjoy the club when you want but don't have to suffer from it in terms of noise. We had a few cars with us which I would avoid next time as there is no parking. There is a parking permit for one car which is helpful if you need to bring supplies but aside from this parking is expensive or out of town. We did find out afterwards that you can park to unload on the pavement in front which makes everything a lot simpler. It doesn't look like you can do this but you can. 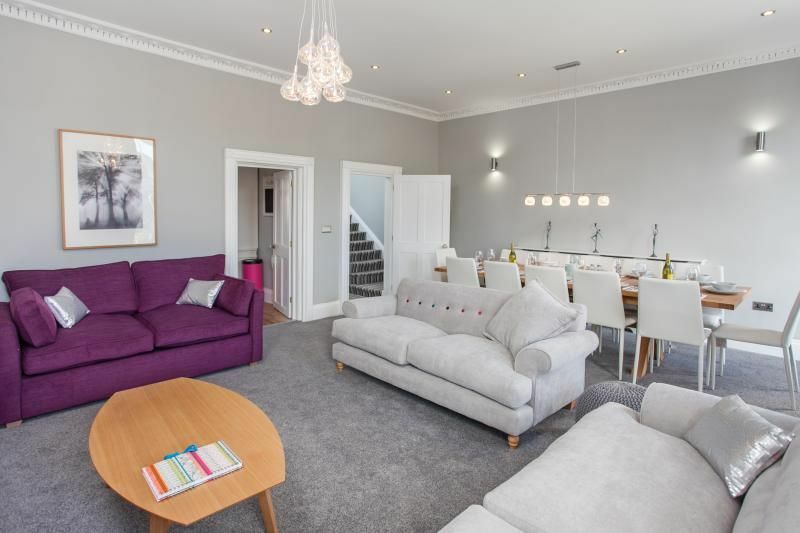 All in all a great stay and we wouldn't hesitate to go back, especially as the guys at Bath holiday Rentals are an absolute pleasure to deal with. We had a truly fantastic stay in Bath - Haystacks is spacious, warm, comfortable and decorated to an amazingly high standard, which was robust enough to withstand the full quota of 14 guests (including lots of children!). 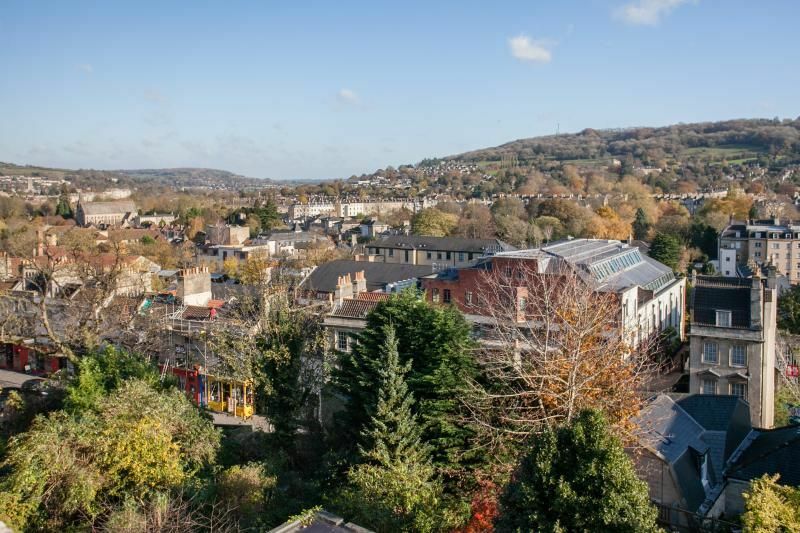 The location is unbeatable - right in the heart of Bath, just a minute's walk to Milsom Street, restaurants literally across the road, and Victoria park (for the kids) within easy (walking) reach. Haystacks is fully equipped with everything you could need, and due to some disastrous weather, the washer/dryer was a godsend. The service we received from Bath Holiday Rentals was second to none, and the little extras (milk, wine, tea, coffee, cereal etc) on arrival made all the difference. 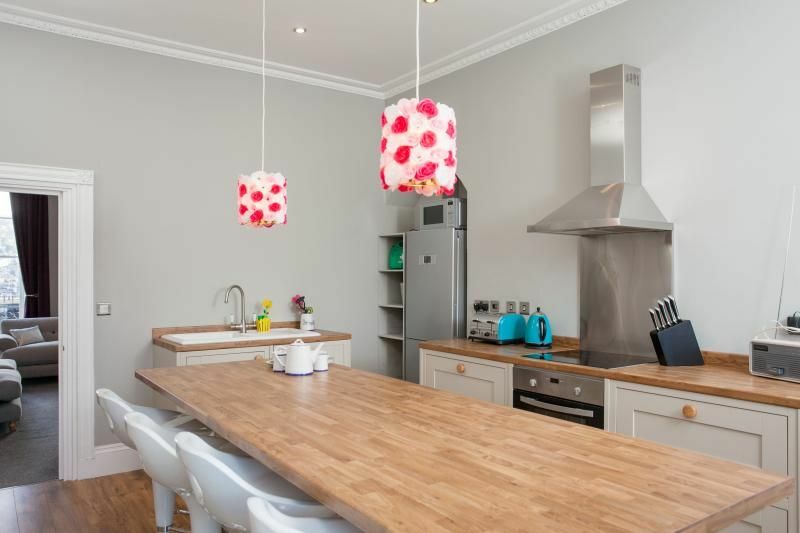 We would definitely rent Haystacks again and would certainly use the services of Bath Holiday Rentals again - the quality of the whole experience was exceptional.